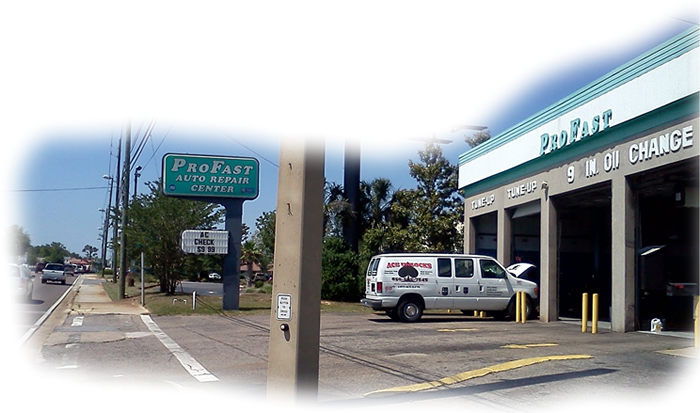 Profast Auto Service Center has been providing Pensacola with quality automotive repair and maintenance services since 1989. We have a convenient location in town to serve you. We can service all makes and models of vehicles. Profast can handle every repair or maintenance service your vehicle needs such as basic maintenance (oil changes, tire rotations, etc. ), brake repairs, computer diagnostics, air conditioner repair, and much more. So come in or call today and let our friendly and knowledgeable staff help you today! We Can Fix Your Car Today! Profast employs honest, friendly, and certified technicians to insure only the highest quality work. We offer great warranties (1 year to lifetime warranties available!). For a list of prices, services offered, coupons, and special promotions, please click one of the links on the left hand side of the screen. If you are in need of a repair or service that isn't listed please give us a call. Chances are we can take care of it for you!